In your study of clouds, you may encounter the term "collar clouds". But what is it and how does it differ from other cloud types? How will you know that it is a collar cloud? And what kind of weather condition does it bring? Read on to find the answers to these questions. Collar clouds refer to a group of clouds surrounding the upper portion of wall clouds. It is often used as a synonym for wall cloud, but collar cloud is just one feature of the wall cloud. A wall cloud is a low-level cloud found on the rain-free base of a thunderstorm that signifies a strong updraft. 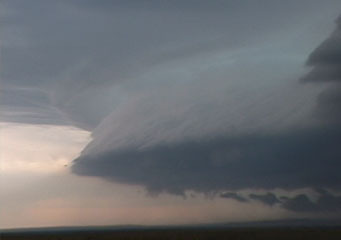 It is often seen rotating in a supercell thunderstorm which could probably produce a tornado. Simply put, a collar cloud is the cloud formation you see circling on top of a wall cloud. How does a collar cloud look like? Collar clouds are the lighter gray group of clouds you see on top of a wall cloud affixed to the rain-free base of a cumulonimbus cloud. It is rain-free due to the upward movement of air towards the wall cloud which prevents the rain from falling down through it. Because of this, the wall cloud and more likely tornado, become visible and rain-free. The diameter of this cloud type may range from one to five miles. And it is normally situated at the inflow side of a thunderstorm. When viewed from several miles away, these clouds may show a speedy upward and cyclonic motion. At what altitude are collar clouds found? Since these clouds are found on the base of a thunderstorm, they can be created near the Earth’s surface up to 8,000 feet. It is the lower cloud formation that stretches out from the cumulonimbus cloud. How is a Collar Cloud formed? Understanding collar cloud formation requires knowing how wall clouds start. A wall cloud develops when a strong rotating updraft or the warm rising air draws in rain-cooled air from the thunderstorm and condenses at a lower altitude. When a large mass of warm air forced upwards is cooled, it brings about saturation of air forming rings of clouds or collar clouds atop the wall cloud. How common are collar clouds? Collar clouds typically herald tornado development and are commonly seen in tornado-prone areas. Tornados occur in most parts of the globe except in the Antarctica because daytime heating, humidity and atmospheric instability, the elements required to create a tornado, are uncommon in this region. On the other hand, the United States of America tops the list of tornado-prone areas with an average of 1,000 tornadoes every year. Tornado also occurs in Africa, Europe, Asia, Australia and New Zealand. It, therefore follows, that there are plenty of sightings of collar clouds in the said areas. When you see a cloud formation circling on top of a wall cloud, those are collar clouds. As these clouds often precede the development of tornadoes, it is therefore wise to be prepared and be cautious when collar clouds make their appearance.